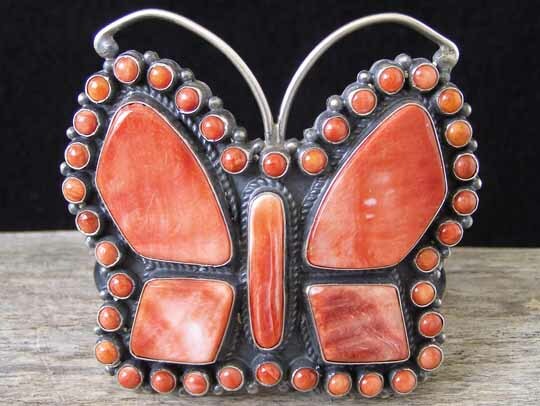 Anthony Skeets Red Spiny Oyster Butterfly Bracelet size 6 5/8"
This is a gorgeous butterfly consisting of four cut pieces of shell forming the butterfly's wings and a long oval forming its body. Thirty-eight rounds of red spiny oyster outline the shape of the butterfly and Sterling wire forms the antennae. The cuff consists of three heavy-gauge lengths of triangle wire and two lengths of twisted square wire spread wide behind the butterfly and tapering to the terminals where the lengths of wire are fused. This is rich red spiny oyster making a very special bracelet! Dimensions of butterfly: 2 7/8" x 2 1/4"